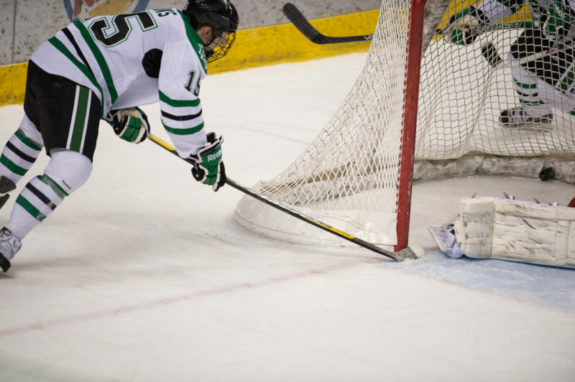 This past weekend, the University of North Dakota hockey team traveled to Oxford, Ohio to play the Miami University RedHawks in the first ever National Collegiate Hockey Conference series. UND came out of their weekend series against the RedHawks with a series split (4-2W & 6-2 L) and an important three points in the standings. If you would have told me that UND would go into the number one team’s building and take three of six points, I would have taken it. So,no, it’s not all gloom and doom for the Green and White. There’s an old saying, you sweep at home and split on the road. After Saturday’s game, head coach Dave Hakstol was not content with the split on the road. For those keeping track at home, there were two NCHC series this weekend, and both of these series ended in a series split. I believe it’s a preview of things to come. This league is going to be a head knocker, and there will be no easy wins in the NCHC. Every game is going to be a war. A team can’t take a night off and expect to win the league championship. I know it sounds cliché, but it’s the truth. In case you forgot, last season, four of the eight teams in the NCHC made the NCAA playoffs. Half of the league went to the NCAA tourney and the other half that didn’t make the NCAA tourney, could be in contention to make the tourney this season. One of the teams (Saint Cloud State University) made the Frozen Four, losing to the eventual runner-up Quinnipiac University. I am going to give credit where credit is due. There’s a reason that Miami was picked to finish first in the National Collegiate Hockey conference preseason media poll. They’re a good hockey team. Make no mistake about it. Their top three forward lines are as good as any that I have seen in college hockey. They go hard to the net and get to the dirty areas. This past weekend, they forechecked UND’s forwards aggressively and didn’t give them a lot of time and space. Turn the puck over on Miami and they’ll put the puck in the back of the net. 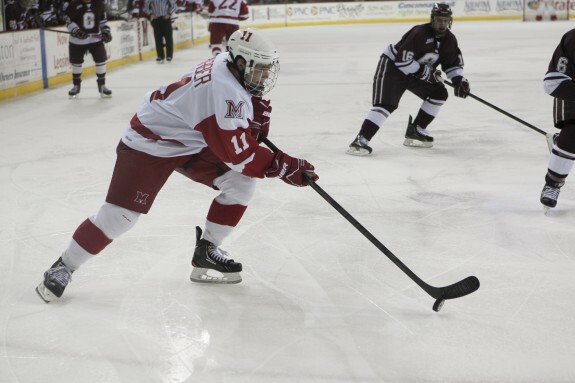 I was really impressed with RedHawks forward Riley Barber (Washington Capitals). While the sophomore forward only scored one goal on the weekend, I thought he’s was a factor in both games. He’s an elite player that will be heard from, before the season is over. Last season, he scored (15g-24a—39pts), and I wouldn’t shocked at all to see him as a top 10 finalist for the Hobey Baker Memorial Trophy. Defensively, Miami is a very good hockey team. The RedHawks shut down the top line of Adam Tambelini (0g-0a—0pts), Drake Caggiula (0g-0a—0pts), Roco Grimaldi (0g-0a—0pts). Not many teams are going to be able to do that this season. I also have to give a stick tap to Miami’s special teams, their penalty kill was good all weekend long. Miami allowed one power play goal in nine penalty kills (1/9, .888 %). When it’s all said and done, I think Miami will be one of the teams to beat in the NCHC. They made adjustments on Saturday and it paid off. I thought that UND skated well most of the weekend, but experienced some bad puck luck on Saturday night.You can’t take a shift off against Miami. On Friday night, I thought UND was the better team and played well. UND was on their toes for most of the evening and they aggressively forechecked the RedHawks in the offensive zone and got in the passing lanes. This past weekend, we got a glimpse that balance. When the top-line was shutout by Miami for the weekend, the second line came through. Junior forward Brendan O’Donnell came to UND highly regarded, but the big rugged forward from Winnipeg, Manitoba had couple of rough years, missing parts of the first two seasons due to injury. When he returned from injury, he ended up being the odd man out, due to UND’s depth. Last season, he scored a total of two goals (2g-8a—10pts). This season, the junior forward has made his presence known and through four games, he has scored (3g-1a—4pts). While one weekend doesn’t make a season, but both squads showed that they’re going to be a force in the NCHC this season. This weekend, both teams will play nonconference foes. Miami travels to Providence, Rhode Island to play a nonconference series against the Providence Friars of Hockey East. North Dakota has a single exhibition game against the US Under-18 Team at Ralph Engelstad Arena on Saturday.